Uber's IPO will likely arrive before the end of the decade. CEO Dara Khosrowshahi confirmed on Thursday that the company's "target" is to go public in 2019. The move is a departure from his predecessor, Uber co-founder Travis Kalanick, who had tried to put off an IPO as long as possible. "We have all of the disadvantages of being a public company, as far as the spotlight on us, without any of the advantages of being a public company," Khosrowshahi said on stage at the New York Times DealBook Conference in Manhattan. "Travis and the whole board now agree that we should just go public," he added. Uber currently has a valuation of $70 billion, which makes it the most highly valued startup in the world. The company has raised more than $10 billion in capital since its founding in 2009. SoftBank (SFTBF), the Japanese conglomerate, has also been in discussions with Uber for a massive private investment expected to total in the billions. Khosrowshahi expressed confidence about getting Uber's entire board on the same page and closing the deal. Related: Uber's next CEO: Who is Dara Khosrowshahi? "There's negotiations going on," he said. "They've probably taken longer than they should have, but we're gonna get there." The event marked Khosrowshahi's first extensive interview since taking over as Uber's CEO two months ago. In the conversation, he spoke candidly about his early doubts about the job given Uber's numerous PR crises at the time. "It was this media circus that honestly I didn't want any part of," said Khosrowshahi, describing his initial feelings when he received a call about the CEO search. Khosrowshahi was then the CEO of Expedia (EXPE). A friend, Spotify CEO Daniel Ek, later talked him into taking the opportunity seriously. Before joining the company, Khosrowshahi reviewed the company's financial and legal issues, as well as reading the blog post from a former engineer that rocked Uber with allegations of sexual harassment. However, he did not ask to read a report on the failures of Uber's reckless company culture put together by former U.S. Attorney General Eric Holder. "The culture went wrong, and the governance of the company went wrong and the board went in a very bad direction," Khosrowshahi said. "But if the product is good, then if you can bring in good leadership, you can ultimately bring it together." 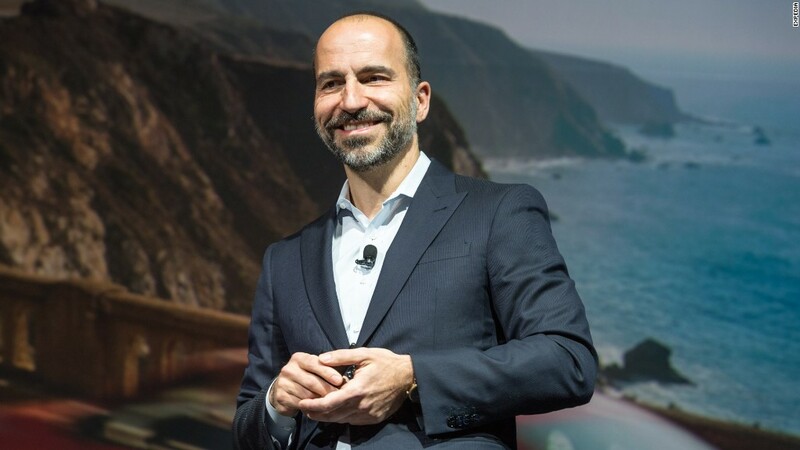 Earlier this week, Khosrowshahi published a new set of "cultural norms" for the company, replacing Uber's "win at all costs" mentality with greater emphasis on corporate responsibility and inclusion. One of the norms: "We do the right thing. Period." But one of the biggest obstacles for Khosrowshahi's turnaround effort at Uber may be Kalanick. The former CEO continues to serve on Uber's board. In late September, Kalanick blindsided the company by using his power to appoint two new board members. Khosrowshahi admitted Kalanick wants to be more a part of the company than he currently is. "It's a good relationship, but it comes with balance. What I told Travis very early on is that any new CEO needs space and needs distance from the old CEO," Khosrowshahi said. "I was a little worried about that conversation, but actually he took it very well and he's been very respectful." Khosrowshahi said he does anticipate leaning on Travis for insights on the business at a later date. "Over a period of time," he said, "I would be foolish not to use Travis's incredible genius and his knowledge that really was largely responsible for getting the company to where it is now."